Turbula - Music - Review of "Roots in the Blues"
Dave Keyes is the kind of blues veteran who has already made his reputation as a sideman and is starting to get his props as a bandleader as well. The New York keyboard player has worked with numerous blues artists, conducted music for Broadway shows and a lot of TV, and has recorded four of his own CDs  including the latest, "Roots in the Blues." These solo discs feature Keyes singing and playing Crescent City-style blues songs with a heavy gospel emphasis. Keyes has a good set of sidekicks along for this project. The guitar work is split between Popa Chubby and Larry Campbell, and both are excellent. Most of the bass, played by Lincoln Schleifer, jumps out of the speakers. For his own part, Keyes burns up the ivories on track after track while giving just the kind of blues power growl that the songs need. And eight of the ten tracks are Keyes originals. After a powerful start with "Blues Bearing Down," featuring a rousing vocal sharing the spotlight with B3 and Chubby's aggressive lines, "Lovin' All the Time" cranks it up even more: a Tex-Mex style rocker that has a nifty little bridge with Keyes laying down some Professor Longhair-vibe keyboard in the middle, before slide guitar and full band rock things back up. "All Black and Blue" is slower gospel blues, with a New Orleans flavor. Keyes is in best voice on the disc on "Didn't It Rain," a pure gospel tune, playing solo piano, again with a strong left-handed boogie-bop style that sounds like two pianists having a finger-speed contest. Elsewhere, the disc has plenty of R&B ("Down to the Bones"), a touch of zydeco ("The Crawl") and no real filler. Fans of keyboard blues will find "Roots in the Blues" irresistible. 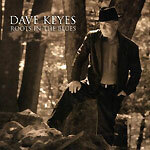 Dave Keyes is a good enough singer and writer to make albums, and his skills on the 88s are the kind of bonus that make this disc something special.